DUNMORE Corporation was a pioneer in vacuum metallized and protective coated fabrics for energy efficient pleated shade applications more than thirty years ago. Today DUNMORE is a global supplier of innovative tri-laminated, light-filtering and 99.9% black-out film-to-fabric solutions up to 74" wide. Our 40 years of metalizing, coating and laminating expertise enables our technical team to help design and create the functional and decorative properties with our customers. Many of our industry partners continue to manufacture or source the various woven and non-woven fabrics with unique aesthetics and function. DUNMORE brings the light management features to the overall shade design with creative sub-assemblies of metalized and coated films. DUNMORE blackout fabric and room-darkening laminates are incorporated into window covering designs adding additional performance and value. DUNMORE films can be laminated to hundreds of woven and non-woven fabrics and materials to provide the required performance with the custom look desired. Our blackout fabric and room-darkening laminates are incorporated into various window covering designs while providing advantageous utility. Our blackout fabric laminates are optimal for visual and acoustic privacy and security and provide superior solar and thermal control. In addition to metalizing, laminating and coating, DUNMORE can perforate and slit your materials to your precise requirements. Our robust constructions are able to withstand the processing rigors of pleating, forming, stitching and perforating while maintaining their unique aesthetic appeal. 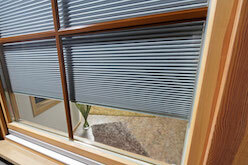 Please Contact Us for blackout fabric laminations or other film-to-fabric laminations for window treatments.